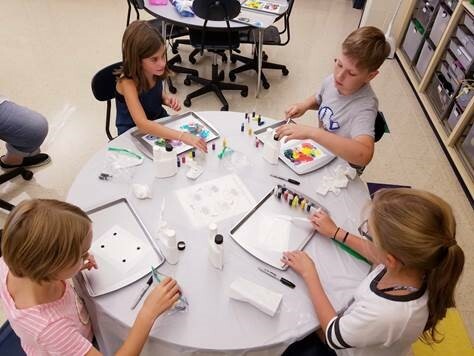 Starting in September 2019, Messenger Public Library will host Ripple Effect, a free STEAM (STEM + Art) course that will be eligible to all North Aurora and Aurora students, ages 8-12. This course has an $84.00/student value and has been generously funded in full by the Dunham Fund in Aurora. Ripple Effect has been running in Batavia for the past 2.5 years and is finishing up its first grant cycle which was geared for Batavia residents. Classes are currently held at their studio in downtown Batavia. A new grant has been provided by the Dunham Fund to extend the program another 3 years and expand it into North Aurora and Aurora. Water Street Studios has chosen to partner with Messenger Library as its North Aurora location. Students creating dendritic art in 2018 Ripple Effect program. The curriculum for the 2019-2020 school year will focus on a creative exploration of the Fibonacci sequence and spiral as it is seen in nature and math. Artistic expressions of the spiral will be created and brought together into collaborative artwork that will be exhibited at Water Street Studios. The course will consist of 3 weekly, one-hour sessions, and several options for days/times will be available. Students may only attend the 3-session course once a year. Note: The February, March, and April 2019 sessions of Ripple Effect, which meets at Water Street Studios, has recently opened up to North Aurora students. The current curriculum explores fractals and dendrites. Families can enroll their children in the current program at https://www.waterstreetstudios.org/ripple-effect.